The USS MOUNT BAKER (AE-34), a Kilauea-class ammunition ship, was commissioned on 22 JUL 1972. 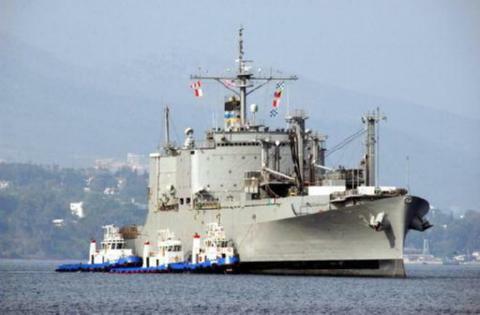 USS MOUNT BAKER served her country for 24 years, 4 months and 26 days, until decommissioned on 18 DEC 1996. USS MOUNT BAKER performed her designed duties from the East Coast of the United State for her entire commissioned career. Sailing to the North Atlantic, Caribbean, Mediterranean, on on into the Indian Ocean as the required as the US Naval presence grew, USS MOUNT BAKER kept the fleet armed. In December 1996 she was transferred to the Military Sealift Command, re-designated T-AE-34, and crewed by civilians under Naval leadership. MOUNT BAKER continued arming the for nearly fourteen years in this role until retired by the MSC in August 2010. NOV 1975 - DEC 1975 Host ship for the crew of Belknap after the collusion. APR 1988 - APR 1988 Helo Crash on flightdeck. Agusta Bay Sicily.